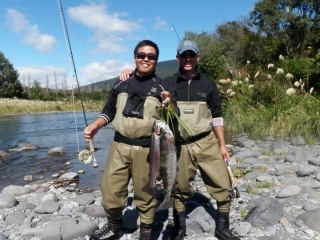 We have been blessed with another great week of weather which has suited most anglers that have ventured onto our Taupo rivers. Bright days has given most anglers the opportunity to still catch fish on the dry fly in shallow fast water but also given good fishing to nymph fisherman in the deeper holes like the Admirals. We have had one day of wind which played havoc with clients who were trying to learn casting techniques but with the use of the water load cast they were still able to lay a decent line to fool the odd trout. I have heard a few complaints this week from overseas fisherman that they are disappointed with not being able to catch fish on the dry fly this year. They are catching fish nymphing but the ultimate for many is to see that splash or roll of a fish on your fly and slowly tightening up on the weight of the fish. I gather that these guys are fishing large Cicada type patterns in pools such as the Major Jones, Duchess, Kamehi or the Admirals which are all fairly deep pools where trout are resting in or feeding of nymphs being dislodged amongst the rocks and not looking to the surface for food. If you are dry fly fishing in the day try and stay in the shallow fast oxygenated water in places like the tail of the Blue pool, Judges, Braids or any other bypass which may hold fish seeking oxygenated water. I have used the dry and dropper all week and have had fish taking of the surface everyday and occasionally picking up the slightly weighted nymph underneath. The best chance of catching fish on the dryÂ is still in the evening down the braids on a still warmÂ afternoon. Try to use caddis or emerging may fly patterns and steer away from the large terrestrial patterns for these fish.Â Â My favourite dry’s have been the Blue Humpy Â (blow fly) or the Turk’s Triantular fished with a great little nymph called the Quasimodo. The Quasimodo nymph is commercially tied and for once is tied on a substantial hook that does not seem to break or straightenÂ and inÂ a size #16 seems deadly. 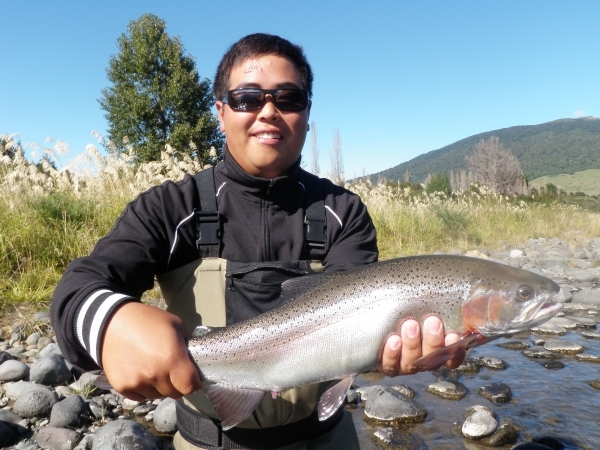 All fly’s can be picked up from Peter at Taupo Rod’n Tackle in Taupo on Tongarrio street. 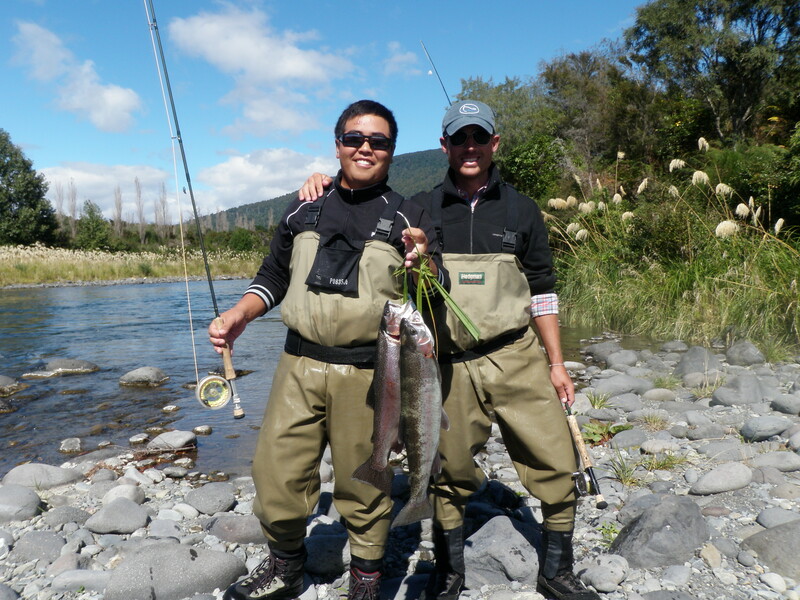 The Tongarrio has some wonderful trout inÂ it at the moment and with a little bit of exploring to find them you can catch fish worthy of a winter spawning fish. Most fish are silver and in pretty condition after fattening in the lake on smelt and koura. The trout above was caught yesterday and weighed just under 5lb and was chockers with mature ready to drop eggs? ?bit early!! I also spotted three or four jacks in shallow water yesterday chasing each other around which is very typical of spawning trout guarding their area while waiting for spawning females-changing of the seasons. Angling pressure seems to be all over the place at the moment with one day very quiet and not really seeing another angler with the next being extremely busy especially around the Stag pool. Still most guys I run into seem to be here on holiday and cashing in on our great weather and super trout fishing with the general consensus being we are very lucky to have this at our door step. Almost all my American clients comment on how quiet our rivers are with anglers and say that if this was at their home town it would be shoulder to shoulder with anglers which would then require the river to be stocked and the wild fishery lost. I think that the summer fishing on the Tongarrio is still it’s best kept secret going of the size of the fish and the conditions that we fish in. For example have a look at the size and number of Browns that enter the river on their spawning runs over this period and compare them to a good back country brown,the size and condition of the Tongarrio brown will usually win easily. The backcountryÂ is still recovering from warm water conditions and an absolute flogging over the past 3 months so I have not ventured out this way for sometime. 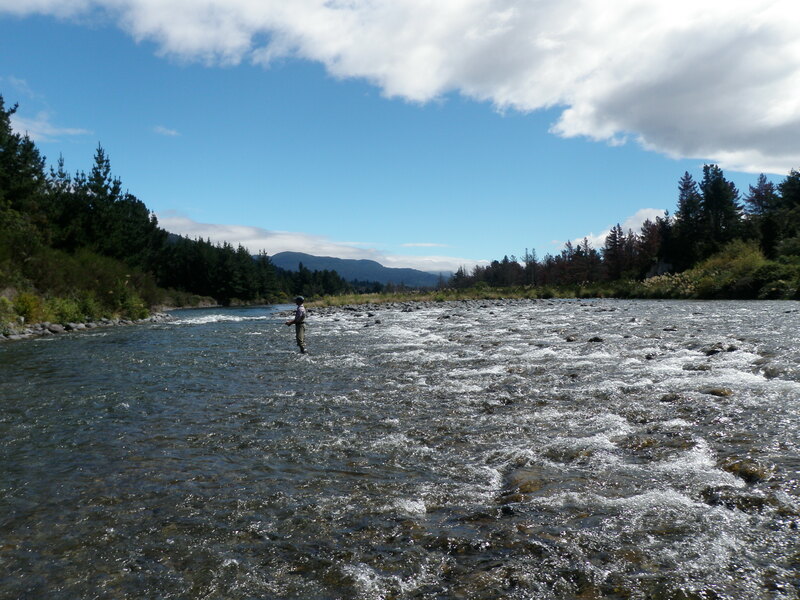 I have been talking with one of the lodges out there though and they say their clients that have been fishing the Wanganui and Whakapapa have found it disappointing andÂ hard. These two rivers at times are fantastic rivers but I think they both need to managed better by Fish and Game by stopping bait and spin fishing and lowering the catch limits. 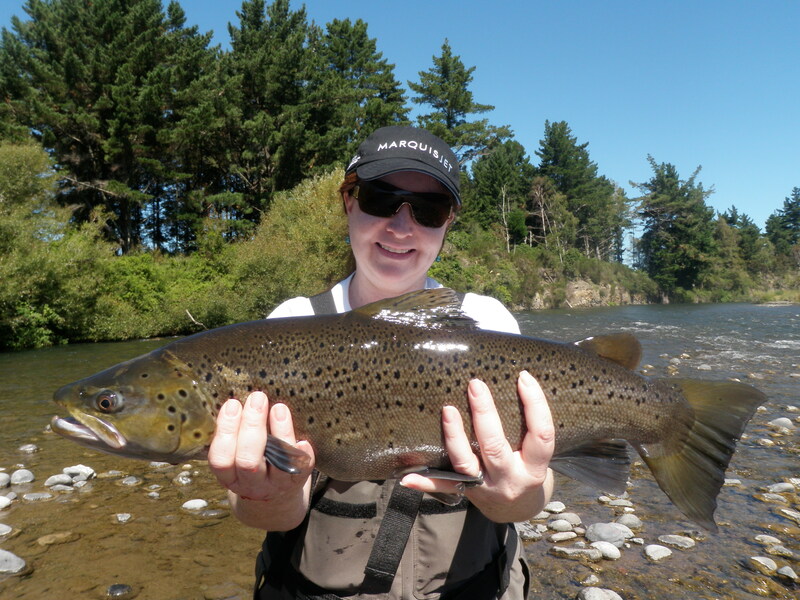 Presently you can kill 5 fish in the Wanganui using whichever method is easiest for you, if this keeps going on we will again loose one of our best rivers to over fishing. It has beenÂ a dry summer in these parts and the rivers have dropped and warmed up which has not made fishing easier, rain is desperately needed by water users and farmers. I have been out and about quite alot this week and have spent most of my time in the same pools as they have been fishing really well for me and my clients. I wont be guiding over the weekend as all next week is very busy so if you get the chance follow my foot steps and fish the Breakfast pool, Blue pool, Boulder pool and the Silly pool. I cant usually go a day without throwing a line or finding new water so if you see me out and about please come over and tell me a few of your secrets. Winter fisherman should start thinking about fluffing the indicators, greasing the line and tying a few glo bugs as it wont be long before we start to have shorter days with colder starts encouraging the first silver bullets up the river. It is hard to say when they will come as the spawning runs seem to be all over the place at the moment but with fish like I have seen this week turning up things are looking encouraging. Boaties have reported nicely conditioned fish from the lake which seem to be better in size and condition than previous years so hopefully this is a reflection of what we can expect in our rivers this winter.